Looking for some new ways to get your whole grains in? Chef Reva’s winter workshop at the Council on Aging focused on whole grains. 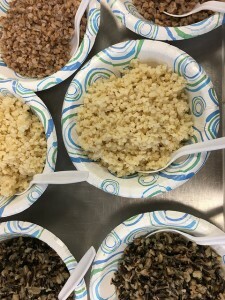 Participants sampled a variety of grains – some familiar, some new – learned how to prepare them, shared recipes, and connected over great food and company. Grab a bag of brown rice, wild rice, kasha, quinoa, farro, or another of the many whole and healthy options available at the supermarket and try something new! Monday, March 27, 1:00-2:00 – “Not your average greens!” Learn about greens and how to prepare them. To sign up, call 781-899-7228. Your microwave is good for more than popcorn and leftovers! 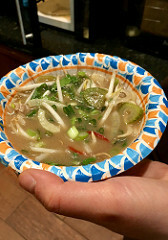 This January, Chef Reva created two delicious soups with residents of the Home Suites Inn transitional housing as part of her “Cooking without a Kitchen” cooking series. These workshops teach techniques for cooking healthy meals in the microwave. Her fresh Mushroom and Barley Soup and Pho (Beef Noodle Soup) are proof that you don’t need a fancy kitchen (or even a stove!) to create delicious and nutritious meals from scratch. Try the workshop recipes below! For more quick meals and snacks, check out the microwave section of our recipe page. Combine onion or shallot, fennel, ginger, beef broth, water and cinnamon in a large microwave-safe bowl or container. Cook on high power for 10 minutes. Remove ginger slices and discard. Meanwhile, heat 4 cups of water in a microwave safe bowl until boiling, about 5 minutes. Add rice noodles to hot water and cook in high 2 minutes, or until tender. Drain noodles and transfer to a large bowl. Add sliced beef to hot broth and cook on high 2-5 minutes, until beef is cooked through and no longer pink in the middle. 4. 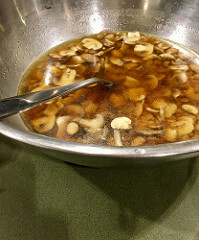 Add Worcestershire sauce, vinegar, and sesame oil to soup. Add cooked noodles, scallions, herbs, bean sprouts and jalapenos, if using. Serve with lime wedges. We’re working together to support the health of Waltham’s neediest residents. Click below to see our video of Healthy Waltham programs in 2016! We could not do this work without your support. But, there is still so much to do. Keep community health a priority for Waltham in 2017 with a year end gift to Healthy Waltham. A small gift goes a long way. Checks can be sent to Healthy Waltham at 510 Moody St., Waltham, MA, 02453, or click on the button at the top of the page to donate securely through PayPal. As a 501(c)(3) non-profit organization, all donations are tax-deductible. Thank you! 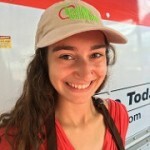 We were very lucky to have Annie Fortnow interning with Healthy Waltham this semester! She has been a wonderful addition to our team and a great presence at numerous events and workshops. She shared some thoughts on her time with us. Thanks, Annie! Interning at Healthy Waltham this semester has broadened my knowledge of food access and education and introduced me to the structure of a small nonprofit organization. So far, my internship has had me working with underserved populations in Waltham to teach them about the importance of healthy eating. During one of the first weeks of the internship, I visited the Greater Waltham Arc, an organization that caters to adults with disabilities, to help lead a healthy cooking demo. We taught how to make healthy pizzas and had our students cut the vegetables for the pizza toppings, roll out the dough, and apply the toppings. Working at this event helped me remember why I became passionate about food justice in the first place. Food and cooking help bring people together. Since everybody eats, food and cooking serve as topics that everyone, no matter their background, can bond over. Encouraging healthy cooking with fresh ingredients both promotes community and helps create healthier individuals in our neighborhood. In addition to cooking demos, I have gotten the opportunity to provide healthy food samples at the Outreach Market put on by Waltham Fields Community Farm. The Outreach Market serves as an opportunity for low-income individuals in Waltham to receive subsidized fresh vegetables. 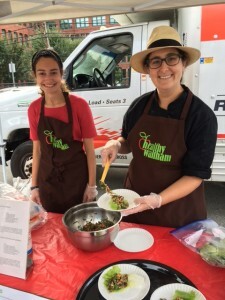 Healthy Waltham sets up a table at the market every week with samples featuring some of the vegetables offered. Providing these samples allows the customers shopping at the market to see what they can do with the vegetables they pick out. Educating others at the Outreach Market helps me bring context to the work that I love to do. Access to local, fresh food is an issue that is extremely important to me. Through my work with the rooftop farm project at Brandeis as the Donation Coordinator, I have gotten to see the impact of providing fresh produce to those in need. Without education about how to use this produce, however, individuals who have never had access to this kind of food may not know what to do with it. My experience with Healthy Waltham taught me the importance of giving context to fresh food distribution. As I continue my internship with Healthy Waltham, I feel excited and honored to work with more individuals within the Waltham community to educate them about healthy eating as well as other health topics. As a senior, I hope to use this experience to determine whether or not health education is a viable career path for me and how I can best use my prior knowledge about food justice and environmental health to help Healthy Waltham.